This entry was posted on Monday, February 27th, 2017 at 5:51 pm. This post will be the first of many regarding the Voss family, particularly renowned sporting art artist, Franklin Voss. 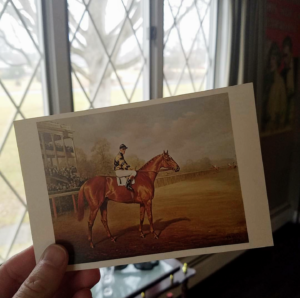 I will give a variety of history regarding Franklin in another entry, but today I’m going to focus on one of his most famous portraits, Man o’ War as a Two-year Old. This piece was painted in 1919, is oil on canvas, and is 28 by 36 inches. 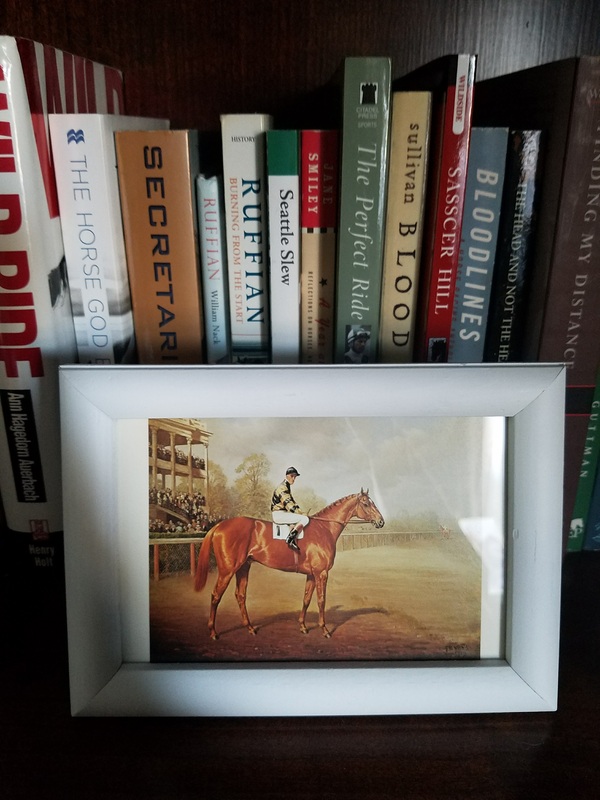 While Man o’ War is depicted at Belmont Park with Johnny Loftus up, Voss actually painted the horse at owner Samuel D. Riddle’s farm in Berlin, Maryland. This was one of three views of “Big Red” completed by Voss. Of course, I’ll never be able to own this original piece of history, but I did find a postcard on ebay for $3! You all know that fixing up my old house has placed me on a tight decoration budget, so I have to do what I can. I found an old wooden frame, spray-painted it white, and placed the postcard inside. What do you think? Design on a dime at its best!